We do NOT seek government recognition. We do not use email for OFFICIAL communications at this time. No Ceremonies are Authorized to be Published on the Internet! is the uniting of The Descendants of the Over-Hill Cherokees, who by family history, oral or documented, know they have Cherokee ancestry. This is the uniting of the people who want to know more about Cherokee history, customs and traditions, and to learn and practice them. The Over-Hill Indian Nation, ( Cherokee Descendants ), has not sought any local, state, or federal authorization; nor has it sought endorsement of the Western Band or Eastern Band at Qualla. We are not in competition with our Brothers of the Cherokee Nation in Oklahoma, or the Eastern Band at Qualla. The Nation is not seeking federal funding. 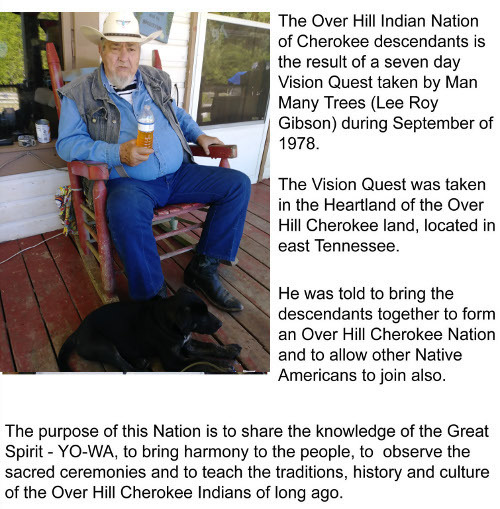 We are only seeking to unite the Descendants of Over-Hill Cherokee People into one Over-Hill Indian Nation. Individuals, families, or other bands are encouraged to contact The Over-Hill Indian Nation. The sole purpose of this Nation is to unite Over-Hill Cherokee Descendants in order to pass on the customs, traditions, history, and the language. We hope to exchange the history of clans and bands with each other and pass them on to the young people of The Nation so that our heritage will live forever. This way our beloved ancestors will not have lived and died in vain.